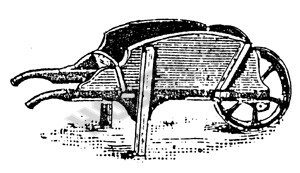 Although they may look simple the wheelbarrows which were made in country workshops were considered to be testing exercise for the young craftsman. Balance and durability were important,so the design had to be considered carefully. This example is one of the last burrows made at a Sussex village workshop. It is now in the Old Kiln Museum near Farnham.